This week's game was a refight of our first SYW refight, if that makes sense. We had played Lobositz back in February using Black Powder but with the advent of the new Honours of War rules it seemed like a good idea to try them out on a battle we'd already done using BP, hence the choice. The rules contain a Lobositz scenario but I used the same troops fielded for my original game, based on Kronoscaf, Charles Grant's scenario in Wargaming in History vol 9 and the excellent Obscure Battles blog. I also use much bigger units than the rules are apparently geared up for, but proportionately the unit footprints were about the same. So we had infantry battalions of 36 covering 300mm, Grenzers of 12-16 and cavalry in 24's deployed in 2 ranks (we ignored the rule in HoW for shooting at cavalry in 2 ranks on this occasion). Saying that, the rules allow for large units of up to 7 stands, which would give a frontage of 280mm so not much difference especially as the number of figures is not relevant to the game mechanics. The author has produced a QRS for larger units such as I use but we didn't see the need to use them, and in the end as everyone was based the same it didn't really matter. Robbie and I took the Austrians while John and Paul were the Prussians. Robbie was FML Browne and Paul was Frederick as he had given me the Frederick vignette earlier in the year and it seemed appropriate that he should get to use it. * indicates superior troops; ** indicates inferior troops. 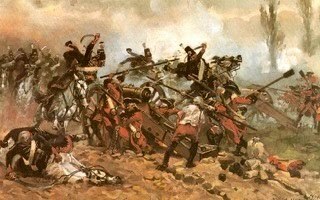 All infantry with the exception of the grenadier battalions of both sides had battalion guns. The Austrian right wing holding Lobositz with Grenzers in the far distance on Lobosch Hill amongst the vineyards. For some reason Marshal Browne and his staff are stood in the middle of the Morelenbach stream having a paddle. Frederick with Colonel Moller's artillery on the Homolka Mound. GM Kayau's cavalry brigade advances onto the plain to try and tempt the Austrians forward. Radicati's Austrians: a regiment of hussars and a combined horse grenadier/carabinier regiment, all venerable Hinchcliffe castings. In the background the Prussian infantry is advancing rapidly towards Lobositz and the waiting Austrians. 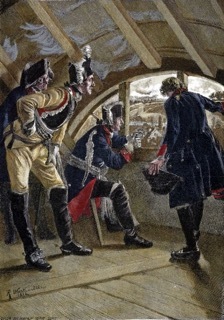 The Austrian left wing was hidden behind the Morelenbach, but Lowenstein's cavalry soon made an appearance. The Prussian attack looses momentum while the Grenzers make a nuisance of themselves harassing Bevern's command. Who put their coffee mug on the table? (Nice mug, picture of FtG and his staff at Leuthen, bought off Amazon). Kollowrat's brigade stand up, having been hidden lying down in the mist behind the Morelenbach. Gessler's cuirassiers join Kayau on the plain. 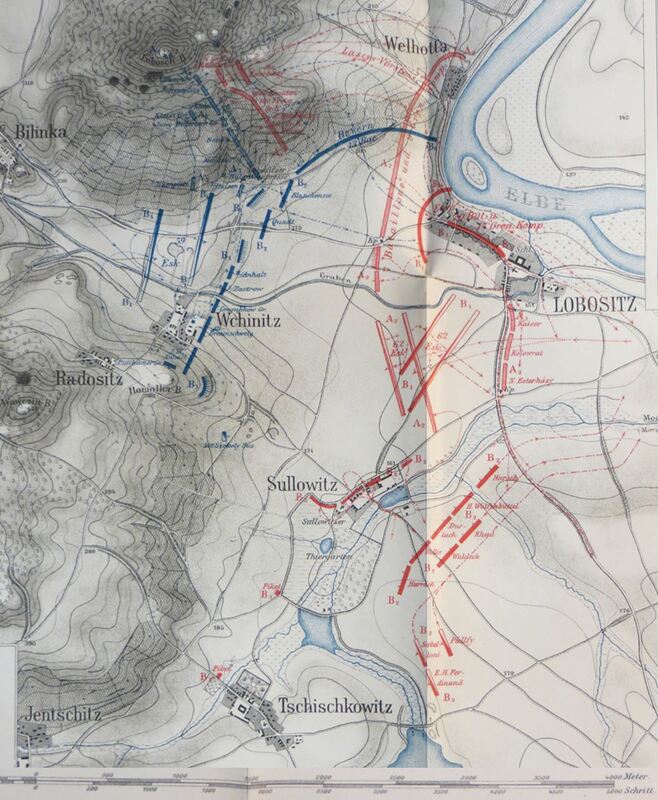 The attack on Lobositz intensified, and although the Prussians were momentarily halted the Austrian grenadiers were forced to retire, leaving the centre dangerously empty of troops until the reserves could be rushed across the plug the gap. The Austrian left wing cavalry made hard going of crossing the stream. For some reason I chose to pledge through the swamp and over the park walls rather than use the bridge, a "Burnside Moment" in reverse! The gap in the Austrian line is filled while the Prussian infantry rally after their attack faltered. The Prussian cuirassiers were charged by the Austrian hussars as a result of the latter throwing a 6 and having a 'dashing' commander. Predictably the hussars were crushed and fled the battle. 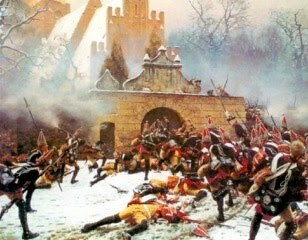 The Prussians did not pursue. The view from behind Colonel Moller's artillery. Actually at this point the game had to finish as we'd fought through from 11:00 until 3:30 with a short lunch break. The rules had taken some getting used to which had slowed things down a bit but it was impossible to say who would be the victor at this point. I therefore played some more moves on Friday and Saturday evenings. The Austrian left wing cavalry are across the Morellenbach, supported by two battalions of infantry. Gessler's cuirassiers turn to face the threat, but have already suffered some losses from Austrian artillery fire and musketry from across the Morelenbach. Nevertheless, both units are superior class cuirassiers and a match for the Austrian facing them. The Prussians have rallied, reformed and launched another assault. The lead battalion is shattered by a combination of close range musketry, and is enfiladed by artillery, but the supporting units are unscathed. 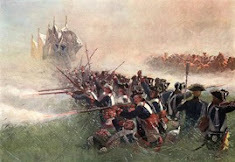 The Austrians lost control of the Lobosch Hill and although an Austrian bayonet charge drove off one Prussian battalion the attackers were forced to retreat after being mauled by the Prussian reserves. The Prussians drive back the central Austrian (Hungarian) battalion exposing their artillery to charges. The Grenadiers on the left are repulsed by close range canister, but the battalion on the right took the battery in the flank and overran it, exposing the flank of another Austrian battalion. On the Prussian right the cavalry clash in a massive melee. 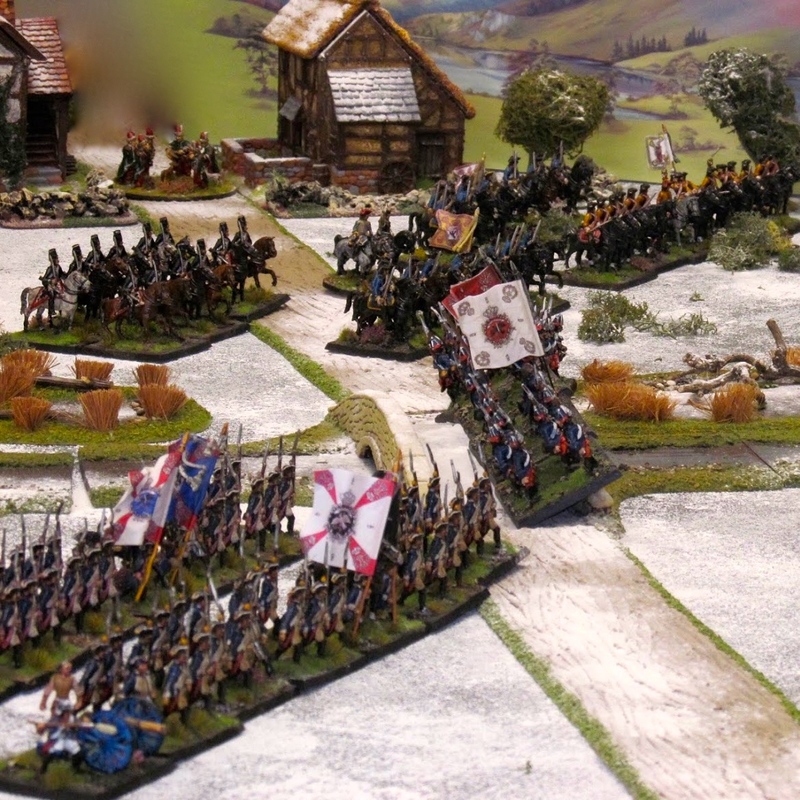 In the centre the Prussians surge forward. The combined elite companies cavalry regiment had been driven off earlier by the Prussian artillery on the Homolka Mound, leaving only the Alt-Modena cuirassiers. Thankfully, the Prussian dragoon regiment in the centre had been targeted by the Austrian artillery over the brook and had also been forced to retire. Opposing cuirassiers clash in the centre. The Prussians already have some casualties from earlier in the battle and are a slight disadvantage as a result. Prince Henry of Prussia and his big brother on the left encourage their troops forward into the centre of the Austrian line. The Austrian right has crumbled, save for a lone grenadier battalion and a 12pdr battery. 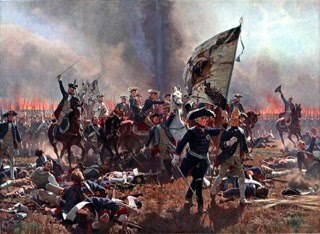 Prussian guns had climbed the Lobosch Hill and helped drive off another battery and kept the retreating Austrians on the back foot. Unfortunately the Prussian troops in that sector were all straining under the weight of their casualties, and any further attacks would be risky affairs. The Prussians have broken through in the centre. The de Ligne regiment and the supporting howitzer battery are in full retreat, the guns abandoned. The Austrian CinC suddenly finds himself in the front rank! Back to the cavalry melees, in the centre the Prussians are broken having come off worst in the combat, but the Austrians are also forced to withdraw to rally. The Austrian dragoons were broken, routing through the infantry to their rear, but again their opponents (on the right) had taken enough casualties to force them to retire. The other Prussian cuirassiers fought dismally and were broken. I called it a day at this point. The Prussians had broken through in the centre but had no cavalry left to speak of. They could basically ignore the Austrians on their right but whether it could be called a Prussian victory is open to discussion. Technically it was a Prussian minor victory, as despite their own losses, the Austrians had lost more and their right and centre were more or less broken. So how did it play? We slowly got the hang of the rules as the day progressed but ran out of time. We made a few mistakes and there are a very few aspects of the rules we didn't like but overall the unanimous decision was that rules are good and we had an excellent game. Very satisfying in fact. The command sequence in the rules is critical to getting your battle plan into action. The Prussians got bogged down as they advanced, and were held up by having retreating units pass through several supporting ones, causing losses in their wake. It wasn't a good day to be a general. Browne was a casualty quite early on, dropping from 'Dashing' to 'Dependable'. Bevern on the Prussian side started as 'Dashing' but was hit twice in rapid succession and finished the game as a 'Ditherer'. Quite a few other commanders were 'knocked on the head' as well. To explain, if commanders are within 15cm of a unit that takes a casualty there is a chance (an 11 or 12 on 2D6) that they have been hit by a stray bullet or cannon ball. It is amazing how many times were all managed to throw 11 or 12 during the course of the game. Of course, they're not necessarily dead, but their ability to conduct the battle has diminished due to a wound, death, the need to change their pants or losses amongst staff and aides de camp. It all added to the fun of the game. We didn't like the fact that battalions without battalion guns (i.e. grenadiers) had a shorter firing range (20cm as opposed to 30cm) AND a minus1 when firing. It made quite a difference and I don't really think the absence or presence of a couple of 3pdrs should have such a significant impact on a fire fight. We also thought that canister range was much too long (50cm for a 12pdr). We did like the grazing fire rule and the ways the rules make you manage your casualties and units carefully. Using my large units made absolutely no difference to the rules or the game. We just used the standard rules for 28/30mm figures and there were no issues (although we ignored the minus for shooting at cavalry in 2 ranks; it had to be more than 2 ranks, in say, column of squadrons. Excellent game, and having spoken to John I have decided to leave it set up so we can refight it again now that we know the rules better. I think the Prussians certainly went into it with a Black Powder mentality (the Austrians did), but these rules are much more subtle, require much more thought, and feel right. Interested to read your assessments Colin as Phil has bought a set for us to try out with my SYW collection in The New Year. Food for thought on the rules, I thought the canister range was a tad long too. I'm keen to try the rules at our club too. Le you I think I'll be amending the firing range so infantry fire at the same distance battalion guns or no. I like your comment about subtlety - the period was less about two lines and more about manoeuver than we give it credit for I think. You just have to love those big cavalry scraps! Thanks Mark, it'd be criminal not to have them! Great to see the Lobositz scenario played out, using your own research. The game looks terrific. For grenadiers without battalion guns, try forgetting the -1 modifier but keep the shorter range. Thanks Keith, the rules worked well and we shall be using them again. Thanks for the in depth report and well founded discussion of these rules, and the lovely photos.